Many companies offer a variety of features in helmets for welding, but the safety of the welder is an important aspect of a helmet that has to be considered. While welding, a person’s eyes and skin can be affected by the harmful radiations that are emitted. To protect from this radiation, the helmet and lens must be well-made and easy to keep in good condition. The filter lens should be connected to the mask properly to avoid any accidents. The darkening of the screen should be enough for the type of welding that is happening. The helmet should also protect the wearer from fumes by utilizing a well-working ventilation system. Another thing to think about is welding becomes hard work when the helmet is bulky and uncomfortable. Many professional welders take the time to find all of these safety benefits in one helmet. 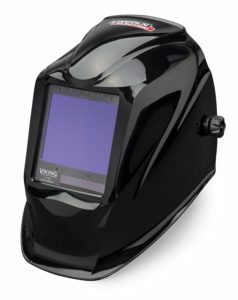 If the welder wants all of the above features and more, the first mask that should be tried is the Lincoln Electric VIKING 3350 (K3034-3). The 3350 is one of the best helmets available. Let’s dive into the incredible well-made features of the Lincoln helmets to see why it the best welding helmet. The welder will decide which features based on the type of welding are the critical ones for his or her needs. Some of the standard features of helmets are listed below. These specs are what make the Lincoln helmets different from the others. Let’s explore some of these excellent features more in-depth. The lens received a perfect clarity rating which makes it seamless for precision welding. This rating also reduces the need to lift the helmet to get it out of the way when working. The auto-darkening feature moves the shade from light to dark when welding starts and back to light when welding stops. This welding helmet has auto-darkening shade settings of 6-13 with a grind setting. This feature is a vast improvement over the typically 9-12 shade range. This auto-darkening feature works great with Plasma, Arc, GMAW, MWAM, and GTAW welding. The shade element can be adjusted by using the selector knob. The light sensitivity of the lens can be adjusted by moving the knob to the right for low sensitivity and left for high sensitivity. These available settings allow the eyes to adjust without straining them. The delay button will also protect the welder’s eyes from the Arc welder’s residual radiation. The four arc sensors make the helmet extremely responsive and will safeguard the eyes from arcs even with low amperage jobs. 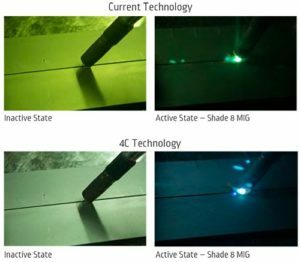 These four sensors also make it less likely to experience a blind spot when welding. Just as a side note about visibility, the shade darkens within 1/25000 of a second. This ability is pretty impressive for a helmet. The appropriate size of a viewing area is dependent on the welder. The average viewing area for a helmet is five square inches, but viewing areas can be as large as eight or ten square inches. A smaller display area is typically used by a part-time worker who only welds when it is needed. A smaller screen will be less weight for the welder to carry, also. A professional may prefer a larger viewing area because it is adaptable to different sized projects. The Lincoln Electric VIKING 3350 (K3034-3) Helmet offers the largest viewing area of the VIKING line with a screen size of 3.74 in X 3.34 in (95 mm X 85 mm). This massive viewing area allows a welder to work in areas where his or her vision may be impaired, and space may be limited. The 4C technology allows a better view, but with the viewing area this large, the Lincoln can say it also has the biggest view. This view enhances the operator’s control making it possible to create the perfect weld. The wider area also makes it easy to weld in positions when looking straight onto a project is impossible. The Lincoln 3350 weighs around 21 ounces which means it a little over a pound but less than two pounds. A lightweight helmet will make overhead welding projects easier to complete. A construction welder will appreciate this feature. The lighter helmet will also ease the pressure on the neck and will decrease fatigue when welding for long periods of time. However, the Lincoln 3350 can tend to get heavy in the face area after a full day of welding due to the enlarged viewing screen. It is significant to note that the Lincoln Electric VIKING is one of the lightest helmets available. This type of heaviness developing over time is common in helmets when welding. This helmet does offer some unique features to help curb some of the discomforts due to the extra weight of the large viewing screen. These features will be discussed in the comfort section. When deciding if a helmet is durable, the warranty must be evaluated first. Lincoln offers a three-year limited warranty for the 3350 helmets. This warranty is offered for free and covers any manufacture defect. Lincoln also offers an extended warranty for up to five full years where there are no out of pocket costs for repairs. The parts and labor are completely covered for the United States and Canada regions. This warranty, however, requires the customer to pay a fee for the coverage. The Lincoln 3350 is made of durable materials and has received high marks for the durability of the helmet. These materials allow a welder to weld without worrying about the helmet not working properly. Without this concern, the welder can have a higher productivity rate which means more money can be earned. The battery is rechargeable, and Lincoln’s technology introduced a longer lasting battery. This rechargeable battery is covered by the extended warranty, and this is the most common defects with a helmet. With these warranties and durable materials, the Lincoln 3350 is one of the best for durability. This helmet offers a lot when it comes to comfort. The improved clarity and the 4C technology of the helmet mean less eye strain. The 3350 has an adjustable head size knob to make the headgear comfortable for any user. The helmet also offers a Fore/AFT adjustment to adjust the distance between the face and lens to improve vision as needed. As previous stated, a helmet can become oppressive after a few hours of welding. The Lincoln Electric VIKING 3350 comes with a unique suspension system to ease the load on the neck and shoulders. One of the best features of this helmet is the ventilation system, It provides optimal air circulation, and the fumes and gasses are kept from the breathing zone. For the price of the Lincoln Electric VIKING 3350, it is truly a phenomenal piece of equipment for all skill levels of welders. Where the process is MIG, TIG, or Stick, this helmet can be used. The technology of the 4C lens leads the competitions in optical clarity, and the viewing size cannot be beaten. Whether it for a professional or a novice, this is the helmet to use.